Back to my Cheap Tricks main page. Many Toyota trucks have separate turn signal and parking light assemblies. The parking light is mounted in the front edge of the fender and the turn signal is recessed in the front bumper. While this setup works fine with the factory bumper, it causes problems with many after-market bumpers. Here's an example of how the stock turn signals mount on a typical aftermarket dual tube front bumper. 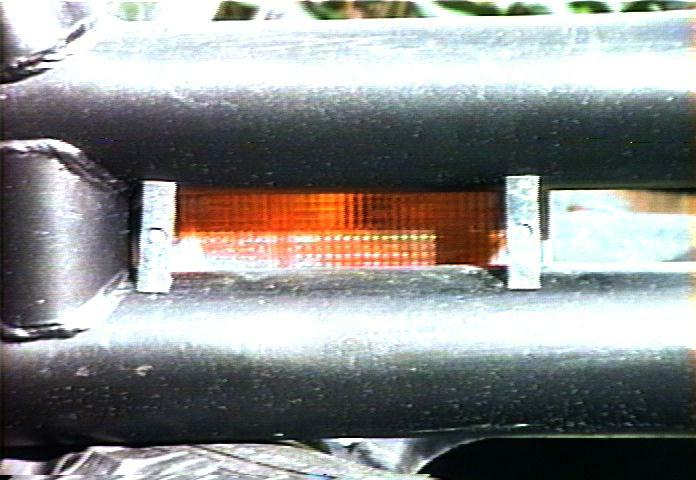 The turn signal mounts on the back of the bumper, between the two tubes. A long screw passes through a triangular bracket and the lens to hold it in place. This setup can cause trouble in the winter, as snow can pack in front of the turn signals, getting trapped between the bumper tubes and the mounting bracket. Unless the snow is periodically cleared, it will mask the front turn signals. 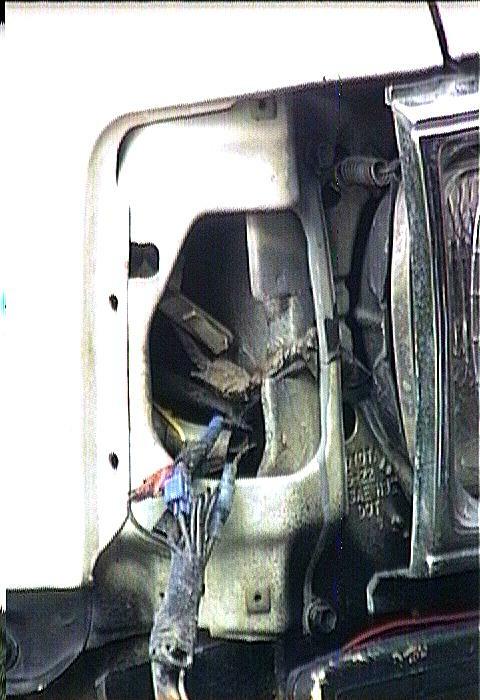 Also the wiring is exposed behind the bumper, directly in front of the wheel well. My other vehicle has a fender-mounted turn signal/parking light assembly that utilizes one socket holding a #1157 dual-filament bulb. This seemed like a better solution, so I set about designing a retrofit for the Toyota parking light assembly. I went to the local auto parts store and found a universal dual-contact lamp socket (Calterm #08547) for an #1157 dual-filament bulb. Note that this is the same bulb that is used in the rear parking/brake light socket. The socket is about 3/4" in diameter and includes a separate metal mounting plate. The #1157 bulb is about 1" in diameter, so this determined the size of the hole in the back of the reflector. Drill two pilot holes for the mounting screws used to attach the socket to the back to the reflector. To duplicate the sealed socket used by Toyota, run a bead of silicone around the base of the socket and let it cure, forming a gasket to seal the back of the reflector. Since the new socket protrudes farther from the reflector than the stock one, you may have to notch out a bit of sheet metal behind the reflector to allow the deeper bulb holder fit. A shot of rust-resistant primer on the freshly cut metal will keep it from rusting. While I had the wiring all apart and exposed, I tapped into the parking light circuit with a tee connection and separate wire. I have used this wire for many different things over the years. It is the trigger power for my fog and rock light relays. I also ran that wire inside the cab where I used it for backlighting power on my radio, accessory gauges and for lighted switches. Tha parking light circuit works in switched power mode, unlike much of the rest of the lighting which is wired in switched ground mode. And by using this circuit, anything triggered by it turns off when I turn off the light switch on the steering column. And with the factory light reminder chime, you can't forget and leave the lights on by accident. Here's the finished assembly. In the above-left picture, note the epoxy putty around the lamp hole, the silicone around the socket base, the two screw holes for attaching the socket and the new socket and bulb. In the above-right picture, note the upper screw has the ground connection tied to it as this socket relies on the base for ground. The new turn signal location is much more visible than the stock signal, especially to the side. The larger reflector and bulb also make the signal a lot brighter. With the lens up higher, it stays much cleaner. The wires are tucked up inside the fender out of harms way. Finally, there's only one bulb to keep track of instead of two (and its the same bulb used in the tail light). This project should take 1-2 hours to complete. This is a non-reversible modification. Once you start cutting, its too late to go back. To change the bulb; unscrew the metal plate and pull out the socket. Be sure to thoroughly test the lights after assembly. Check turn signal operation with and without the parking lights and headlights on. Make sure the rear lights still work, too. Here is how the combined turn signal/parking light works. In this case, I have the pareking (side marker) lights on plus have activated the turn signal. And you can see that the side marker light stays on (the low wattage filament in the 1157 bulb) and the brighter turn signal filament blinks on and off. So one light, two functions! Note the the lens illumination is much more uniform than captured by the camera, which only shows a pin-point of light. This is also why I chose to use a filament bulb instead of the popular LED retrofit, as the filament bulb throws light more uniformly around the surface of the lens. 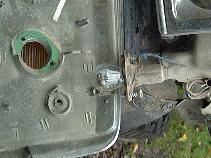 The first is that the 1157 bulb used matches the one in the rear brake/parking light socket. So as far as carrying spare bulbs, that eliminates the need for a different bulb type in the parts box. The second is that you'll now know where the wiring for these lights are and how they are connected. Armed with this knowledge, projects like adding fog and driving lights are simplified. For example, when I installed fog lights, I wanted to make sure the fog lights could be on at any time other lights were on and would go off when lights were turned off. 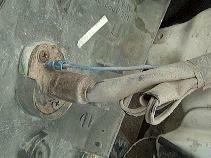 This was easily accomplished by powering the fog light relay from the parking light "hot" wire, i.e. the one that isn't common with the turn signal. Since I clearly labeled the connectors and wires, it was a simple matter to tap into this line to get switched power for the relay.